Treasurer or, according to II Macc. iii.7, R. V., chancellor of Seleucus IV., Philopator. At the instigation of Apollonius, Seleucus sent Heliodorus to Jerusalem to seize the treasure of the Temple. The high priest Onias resisted him, pleading that the money in the treasury was reserved for widows and orphans; but Heliodorus forced his way into the Temple. There he was stopped by the apparition of a horseman charging upon him, while two young men scourged him pitilessly. Heliodorus was carried out of the Temple insensible; and only by the offering of the high priest was he restored to consciousness. Heliodorus therefore left the treasure untouched, and returned to Seleucus with an account of his experience. Questioned by him as to whom he should next send to Jerusalem for the treasure, Heliodorus advised him to send his worst enemy, the enemy whose destruction he most desired (II Macc. iii. 7-iv. 1). In IV Macc. iv. 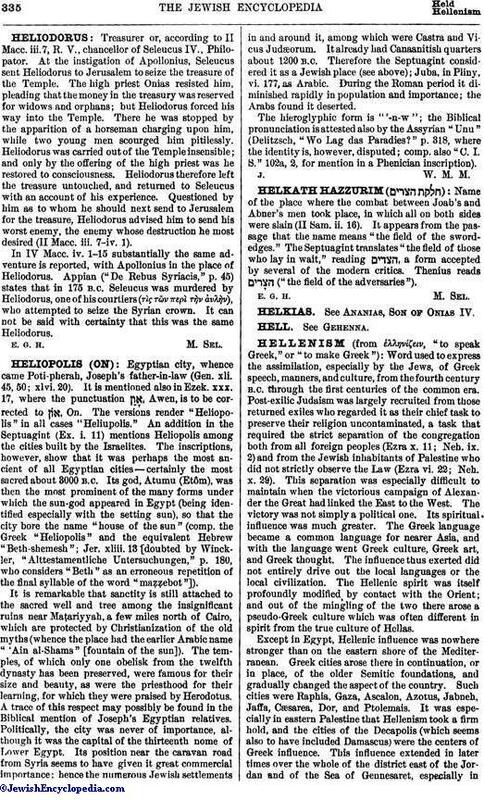 1-15 substantially the same adventure is reported, with Apollonius in the place of Heliodorus. Appian ("De Rebus Syriacis," p. 45) states that in 175 B.C. Seleucus was murdered by Heliodorus, one of his courtiers (τὶς τῶν περὶ τὴν όνλὴν), who attempted to seize the Syrian crown. It can not be said with certainty that this was the same Heliodorus.